Chickpeas are an excellent source of the essential nutrients, iron, folate, phosphorus, protein and dietary fiber (USDA nutrient table). 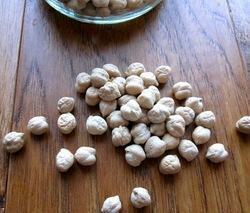 Chickpeas are low in fat and most of this is polyunsaturated. The nutrient profile of the smaller variety appears to be different, especially for fiber content which is higher than in the larger light colored variety. One hundred grams of mature boiled chickpeas contain 164 calories, 2.6 grams of fat (of which only 0.27 grams is saturated), 7.6 grams of dietary fiber and 8.9 grams of protein. Chickpeas also provide several essential nutrients in moderate amounts of 10-19% of the Daily Value (table). Possibly resulting from this nutrient richness, preliminary research has shown that chickpea consumption may lower blood cholesterol.